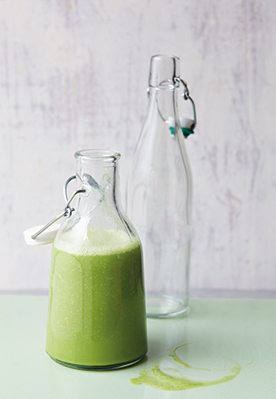 An alkalising green smoothie is a great way to start the day! Put all the ingredients into a high-speed blender and pulse. If the smoothie seems a bit too thick for your taste, simply add a little more filtered, alkaline water or coconut water. Nutritional nugget: All the green vegetables included in this wonderful smoothie are rich in alkaline ingredients. Chlorophyll (the green pigment) cleanses and hydrates the intestines. Magnesium ensures that there’s proper peristalsis in the gut and balanced heart function. They’re also rich in highly absorbable iron.